Ethernet Backhaul is a feature which makes it possible to wired the Deco units together. Thanks to this feature, every two Deco units can be wired with an Ethernet cable. And Deco will transmit data between two units through the Ethernet connection, which is more stable and faster than Wi-Fi. Once Ethernet backhaul is established, Wi-Fi backhaul will disconnect automatically. 1. Please note that the main Deco unit will act as an NAT router by default. 2. Please set up the three Deco units on the same network at first through the Deco app before you wired them together. 3. Please make sure there aren't any other DHCP servers behind the main Deco. Otherwise, it will cause the second and third Deco units obtain an invalid IP address which doesn't have internet access. 4. If you have switches on the network and find Ethernet Backhaul not working, please check the management IP address of your switches. It seems that some switches adopt 192.168.0.1 (which is the same as the LAN IP address of the main Deco) as the management IP, which may cause some conflicts on the network. In this case, it's recommended to change the management IP address of switches to another subnet. Q1: Can I connect all the Deco units directly to my home modem/router? Only the main Deco could be connected to your home modem/router. 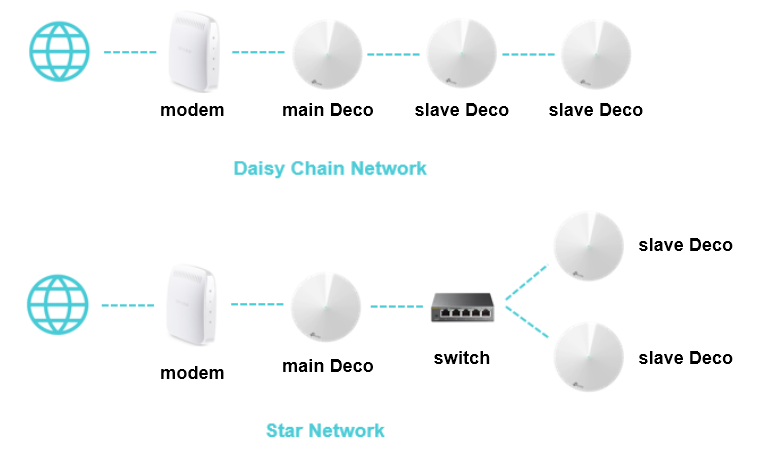 Other slave Deco units should be connected behind the main one, just as the Star Network shows. If not, they may be in a loop and cause unexpected dropout issues. You can connect all the Deco units directly to your home modem/router/switch as you want. The system will work as expected. Q2: To use the Ethernet Backhaul feature, do I need to wire all my Deco units? Nope. You can setup one for wireless backhaul, and the other one for Ethernet backhaul as what you want. For example, if you have three Deco units and want to create Wi-Fi not only in your house, but also in the garage, which is a little far from the house and without Wi-Fi coverage. Then you can put the main Deco and slave Deco 1 in your house (wireless backhaul). As for slave Deco 2, you can place it in the garage with a long Ethernet cable connected to the main or slave 1 unit. In this case, the slave 2 unit will work through Ethernet backhaul, while the main and slave 1 will work through wireless backhaul. Q3: How do I know if Ethernet Backhaul takes effect? Will release new firmwares for Deco series soon, which will show how Decos are connected to each other. Let's look forward to the new features. Q4: Why my Decos become unstable once they're connected via a switch? It's probably that you're using a D-Link switch. The Deco Ethernet backhaul feature is based on the standard IEEE 1905.1 protocol. However, we find that some D-Link switches will not forward packets based on IEEE 1905.1 protocol, causing all Deco units in a loop and become quite unstable. If you have a D-Link switch and encounter unstable issue with Ethernet backhaul, we recommend to change another brand of switch or contact D-Link support directly for a fix. If you're not sure which switch to use, TP-Link switches may be a good choice. Q5: Can I set up Ethernet backahul through a powerline connection? That's okay if the powerline connection doesn't block any data flow. Q6: Can I set up different Deco models such M5 and M9 Plus together through Ethernet backhaul? Yes, just configure and add different Deco models in the same Deco network. After that, you can wire them to set up the Ethernet backhaul connection. You could refer to the link below for how to add different Deco models in the same network. Dear TP,Is is strictly necessary for AP's to be in WiFi range of at least one other AP when they are connected by Ethernet as well? Nope, once the Deco units are wired together, they will communicate with each other directly via the wired connection bypassing Wi-Fi. You can have a check on your side. Does it matter which port on the DECO we use to connect to the wired switch? And can we then hang another switch off the 2nd/3rd/4th deco and pass wired traffic to those devices? Ethernet backhaul is NOT working for me can you please help? If I connect my older Asus router in Access point mode in place of second deco 5 or Third Deco 5 my Asus router works in Access point mode. Can you please give us detailed steps regarding how I can connect. When I try resetting 2nd or 3rd deco it blinks blue and try to connect but gives some error error.at the end. Yep, you can do like that. Just make sure all the data from 2nd/3rd/4th Deco units are finally forwarded and processed by the main one. Have you tried to connect the second Deco directly to the LAN port of the main one? Will it work in this case? If yes, it seems an issue between Deco and the switches. Try to change the management IP address of the switches for a check. Need to clarify that you need to firstly set up the three units in the same network via the Deco app before you use the Ethernet Backhaul features. Nope, once the Deco units are wired together, they will communicate with each other directly via the wired connection bypassing Wi-Fi.You can have a check on your side. Dear TP, I did check and it most certainly looks like the Deco units need to be in wireless range even when hard wired, if a unit is out of WiFi range it goes red and is reported in app as not connected. The thing is that this behavior is not consistent nor immediately. However, there surely is something fishy with the wired backhaul. Hello! I do not quite follow this instruction. Do you mean that you should link them through WiFi first ("same network") and then connect them? Or do you just mean that it should be a separate switch for all Decos? Hi, is it possible to have two of my deco devices connected with ethernet cables and the third connecting over Wifi? One of the connected ones would be the one connecting to the modem. How do I check that the backhaul is over Ethernet?